Can Your Dentist in La Cruces Help You Find Oral Cancer? When you hear “cancer,” there are too many people that may be able to relate. Someone’s mother has had it, brother passed away from it, or even a friend of a friend might have even been diagnosed. Unfortunately, cancer is a disease that is taking a toll on today’s society—and your dentist in Las Cruces doesn’t want you to be the next victim. In fact, this blog post is to spread awareness of an all-too-familiar orofacial disease: oral cancer. Too many patients are affected by it, even though it’s so simple to avoid and treat early on with regular cancer screenings! Learn more about the importance of oral cancer screenings in this week’s blog post. As mentioned above, there are too many people that have come face to face with oral cancer diagnosis. Oral cancer can affect anyone, although there are some people that have higher risks than others. For instance, people who use tobacco are significantly more likely to have oral cancer, especially when tobacco use is combined with heavy alcohol consumption. 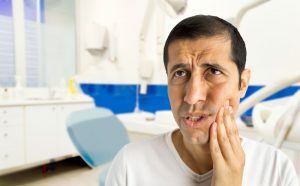 Your general dentist will examine the soft tissues of your mouth for signs of oral cancer during a regular dental visit, but you should also pay attention to your mouth as well when you’re at home. If you do notice any abnormalities, the very first thing you should do is contact your local dentist. What do I look out for at home? Sores, lumps, or bumps around or inside the mouth. Numbness around the lips and mouth. Abnormal swelling in or around the mouth. Lesions in the mouth—especially around or underneath the tongue. Swollen lymph nodes in the neck behind or around the ears. Where can I get help for signs of oral cancer? Oral cancer is no laughing matter, so our dental practice performs regular screenings as well as biopsy of suspicious spots and treatment of oral cancer. This helps to double your chances of recovery if you discover and treat the disease early on! When was your last oral cancer screening? Regular examinations are key to the early detection that could save your life. When you choose to visit Painted Skies Dental Center, you can be confident that you’ll be cared and looked out for—even when facing a dauting diagnosis like oral cancer. Our goal is to help prevent problems like these and preserve a healthy mouth, so the minute we notice anything out of the norm, we will be open with you and discuss treatment. Schedule an appointment for an oral cancer screening with your local dentist sooner than later! Comments Off on Can Your Dentist in La Cruces Help You Find Oral Cancer?